What is this tiny but menacing bug? 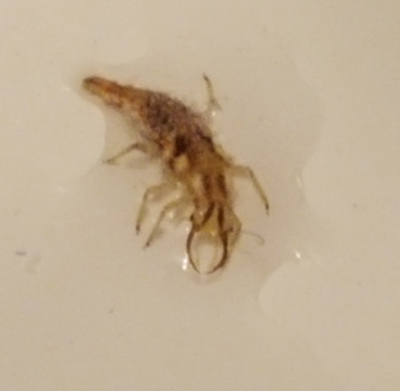 I found this terrifying creature on my bathroom sink. Six legs and only about 5mm long, but it has pincers! What is it? There's no photo at that link but I'd guess an earwig? Not an earwig, the pincers seem to be at the head end. It's an insect nymph of some kind - possibly a lacewing. Yep, predatory nymph, likely a lacewing, compare photos here. This guy will devour aphids and other pest bugs, usually considered a beneficial insect for gardens. Fun fact: sometimes they build a carapace out of debris or the bodies of their victims. Behold beauty of nature! Lacewing nymph, eh? So what was it doing in my bathroom? Insects are both amazingly complicated but also sort of dumb. Lots of times they end up where they are by accident. None of us belongs anywhere, we're all gonna die, etc. This little dude could have hitched a ride on you or any housemates/pets, that would be my best guess.